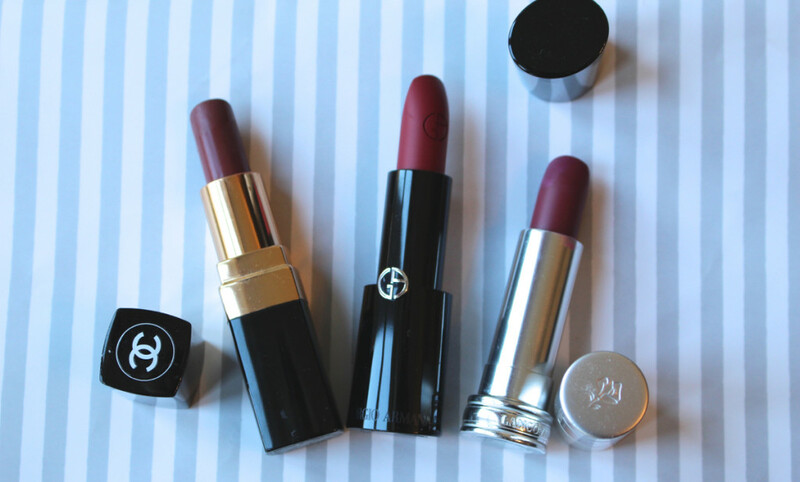 As soon as the winter chill sets in I like to vamp up my makeup with a strong berry lip and I have three lipsticks that I’ve come to rely on. Enter the delectable Chanel, Mr Giorgio Armani and my good friend Lancôme. Let’s start with the one that’s been in my collection the longest, Chanel Rouge Coco, Venise 26, this berry is deep and plum-like. It moisturises as it goes and lasts for hours. Plus, there’s nothing I love more than visiting the Chanel makeup counter. Second in command and the most berry of them all is Lancôme Rouge in Love, Rose Sulfureuse in 379N. I love the Rouge in Love line, I find it super hydrating which my chapped lips definitely need. I can slick this on and be good to go in minutes. And finally, let me introduce the latest to my collection, Giorgio Armani Rouge d’Armani Lipstick 406. Now this looks much darker in the bullet than it does on. I applied it for the first time this weekend expecting a deep red but what I got was an even better deep raspberry. After applying, I like to dab this one down with my fingers to smudge it in a bit, I find it softens the colour on me and makes it last even longer, even when eating and drinking. What are you favourite winter lippy shades?